I think this is pretty close to the one that we use. Thanks for the reminder, we are totally out and I need to make up some more to have ready during the week. The boys love tacos and they are so easy to make. Hey Chris, I usually make a triple or quadruple batch. But it’s so good, it doesn’t last long! Thanks for the recipe! I can’t wait to try it. Love your blog! You won’t be sorry. Let me know how it works out for you. The hotter the taco the better. Shawn, this is an unbelievably good recipe. Hopefully most folks have all these spices already in their cabinets. I make an 8x recipe that is good for seasoning 8 – 12 lbs of ground beef. We simply store it in an air-tight container, and add a tablespoon or 2 for each pound we cook. Secret bonus: when cooking the meat, add 1 or 2 Chipotle en Adobo and a little of it’s sauce to really boost the heat. Yum!!! I love me the chipotles! Great mix dude. Gave it a shot last night. After mixing it, I put it in a mortar and pestle and seriously combined the ingredients. I also added a pinch of allspice. It’s a heavenly mix. Thanks DEFCON. I used this recipe and added some Ring of Fire® Habanero Hot Sauce “Original” to the finished product. I will undoubtedly be doing this again. Robbie that sounds awesome. Glad you liked the taco seasoning recipe! It beats the hell out of those packages. This is something very similar to what I use. 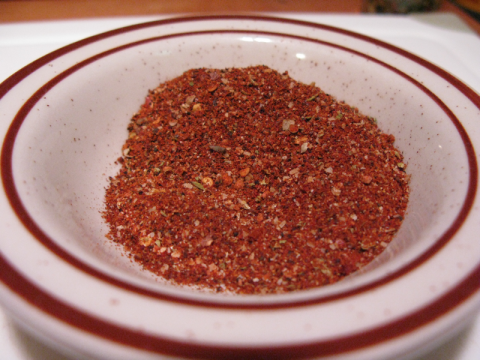 I would use cayenne pepper in place of paprika and probably skip red pepper flakes (or use habanero flakes if making for myself). While I have not made this exactly as is, I will personally guarantee anyone out there who has any doubts it is a very good mix. Hey guys, I came to this post after hearing about it from Scott Roberts’ most recent Weekly Firecast, so I am looking forward to giving it a try this weekend for some football playoff (GO RAVENS!) nachos! One thing I know I will substitute is dark beer for the water….I’ll let you know what I think….cheers! Dark beer eh? That sounds like a great idea. Thanks Thom! Oh Brian that sounds awesome I will give that a try the next time I make tacos. Thanks for recipe and this blog we really enjoy reading it. Thanks Tracy, let me know if you like it! I tried it, and it was good. Thank you. Is there an easier way to print out recipes from this site? If you just click print you get the intire website. If you copy and hit select, you get two pages with a large picture. How about a “click to print” button or ??? I put in a little M.SG. oh! i know——–but i like. It’s great, never looked @ buying seasoning anymore.